Bungalows Los Arcos Apartamentos is just a 12-minute walk from the beach. Nestled among lush gardens spreading over 60000 sq. 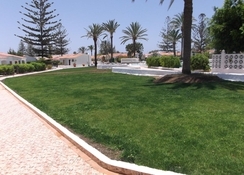 meters, the aparthotel is located in Playa del Ingles, 600m from Yumbo Centrum. The property is split into four sections each with parking, its own garden and a large swimming pool (heated in winter). Additionally, the aparthotel has many recreational areas for activities including an 18-hole mini golf course, a playground, table tennis and more. If you do wish to explore the surrounding area though, Bungalows Los Arcos Apartments are centrally located and just 400m from Gran Canaria’s bustling town centre where you’ll find plenty of shops, dining and entertainment. The reception is open 24 hours and offers many tourist-friendly services such as currency exchange, payphone booths, car rental, medical service and laundry and more. 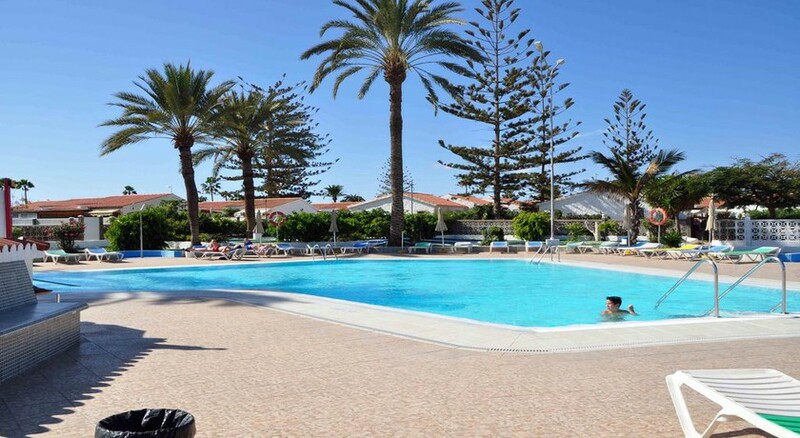 The popular Maspalomas Beach is 1km away from the Bungalows Los Arcos Apartamentos. The property is very close to the town centre and the shopping centre Yumbo. There are with plenty of dining, party and entertainment options nearby. The distance from Gran Canaria Airport is 29.5km. Bungalows Los Arcos Apartamentos complex offers luxurious guest accommodation with its 339 bungalows. Each of the apartments has a living room, bedroom, TV and telephone - kitchen, complete bathroom with hairdryer. There are four swimming pools, and a terrace with solarium furnished with tables, chairs and hammocks. All units include a dining area and a seating area with a TV. 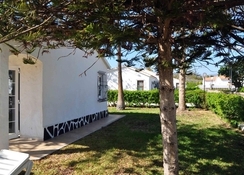 The Bungalows are equipped with bathroom (bath/shower), hair dryer, kitchenette, fridge, TV (extra charge), telephone and terrace. 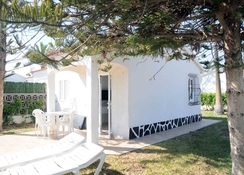 Bungalows Los Arcos Apartamentos is a self-catering residence and all the guest apartments come equipped with a kitchen to enable guests to prepare their own food. However, there is an a la carte restaurant on-site serving local and international cuisines and a snack bar to cater to guests. The neighbouring resort also has good dining options and bars. The quiet pools at Bungalows Los Arcos Apartamentos are equipped with showers and hammocks for guests to use post-swim. In addition, the aparthotel has several recreational facilities for activities such as an 18-hole mini-golf, playground and table tennis - great if you’ve got the kids on board. Bike rental is offered at the property and therefore the space is full of relaxation opportunities for the travelers seeking peace and quiet. 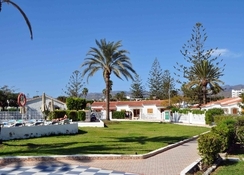 Cita Centre, buzzing with activities is just 800m from Bungalows Los Arcos. Free! Free public parking is possible at a location nearby (reservation is not needed).